On the Hill Cumorah, Joseph Smith was tutored by the angel Moroni and obtained an ancient record containing the fulness of the gospel of Jesus Christ. From that record, he translated the Book of Mormon by the power of God. Today the site includes a visitors’ center at the bottom of the hill and a monument at the top of the hill. The visitors’ center offers a self-guided tour including interactive exhibits and artwork that tell the story of the Restoration of the gospel of Jesus Christ. Missionaries will be available to answer your questions. Two paths lead to the top of the Hill Cumorah: a paved road for automobiles and a walking path if you prefer a short hike. Both paths are self-guided. 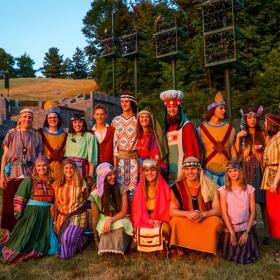 If you choose to experience all that the Hill Cumorah and the visitors’ center offer, plan to spend between 1 and 2 hours there.